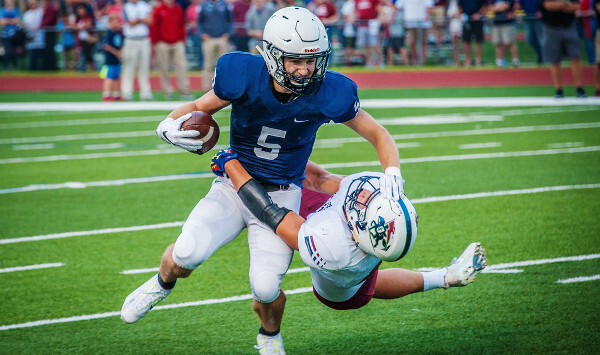 St. James Academy and Mill Valley will repeat their season opener when these two Eastern Kansas League teams meet in the quarterfinals. The Thunder defeated Mill Valley 45-21 to open the season with the help of five Jaguar turnovers. However, the Jaguars struggled early and started with a 2-4 record. Mill Valley is now on a four-game winning streak. Mill Valley's four losses came to teams that are still alive in the quarterfinal round of their respective classification. Last week, the two-time defending state champion Jaguars defeated KC Schlagle 57-12. Brody Flaming completed 13 of 19 passes for 251 yards and two touchdowns in the win. On the season, Flaming has passed for 2,364 yards and 20 touchdowns. Logan Talley is the top receiver with 70 catches for 954 yards and 10 touchdowns. Cameron Young leads Mill Valley’s rushing attack with 733 yards and 13 TDs. St. James won its first five games of the season but struggled some down the stretch. The Thunder defense, however, has only allowed seven total points the past two weeks. Last week, the Thunder earned a 19-0 win over Shawnee Heights. Senior Jack Petz paces the St. James offense, rushing for 1,322 yards and 20 touchdowns. Last year, Mill Valley eliminated St. James from the playoffs with a 28-14 win in this sam quarterfinal round. Maize has become one of Kansas’ biggest surprises this season with a 9-1 record and rise into the Class 5A state rankings and quarterfinals appearance after a 41-14 win against Wichita Heights last week. The Eagles were 7-3 last year. Bishop Carroll has bounced back from a rare Round of 16 loss and 7-3 mark in 2016 to post a 9-1 record and win the City League under first-year coach Dusty Trail, formerly a long-time assistant. Last week, Maize rolled over Heights behind a dominant defensive performance that included a fumble recovery for a score. The Eagles held Heights’ explosive offense to 59 plays for 164 yards. Maize quarterback Caleb Grill finished 17 of 29 for 187 yards and three TDs. Dalyn Johnson has produced another strong year at running back, and Preven Christon and Camden Jurgensen have been among the team’s top receivers. The big improvement from last season comes on defense. Last year, Maize had a total margin of 304-297. This year, the Eagles are at 287-169. Carroll has also improved. In ’16, the Golden Eagles scoring margin was 366-244 and stands at 422-213 this year. This marks one of Maize’s best seasons in school history. The last time the Eagles won at least eight games came in an 8-3 season in ’06; it’s been more than 13 years since Maize won at least nine. Maize’s best finish ever was a semifinal showing in 1990. Bishop Carroll’s Braden Howell has produced a big year behind center and helped carry the offense through some injuries throughout the year at running back. In Week 8, Carroll held off rival Kapaun to win the Holy War and the City League, 30-22. Last week, Carroll easily defeated the Crusaders in a rematch, 41-6. Carroll’s defense limited Kapaun to 167 total yards. Howell completed 16 of 22 passes for 285 yards and five scores, including three TDs to Joseph Holtusen, part of a deep receiving corps. These two teams have rarely played in recent years with just two meetings since ’04. In ’14, Carroll defeated Maize, 69-7. In ’15, the Golden Eagles beat Maize, 48-26. Maize has been a great story and enjoyed an excellent game against Heights, but Carroll’s passing attack gets the edge.